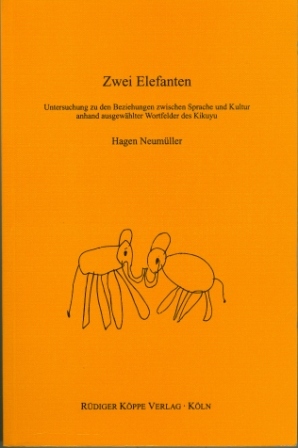 Author: Hagen Neumüller. Series edited by: Bernd Heine, Wilhelm J.G. Möhlig. For the first time, this book introduces methods of analysis which have been developed and tested in this study and with which one can compare the whole vocabulary of different languages instead of only semantic parts. The first part consists of a detailed theoretical discussion of the relationship between language, culture, thought, and perception which is followed by a comparison of the German, English, and Kikuyu lexicon. Kikuyu is a Bantu language which is spoken by 5 million people in the highlands of Central Kenya. Most structural variations were found in the field of ‘religion’. Component analyses and evaluations of ethnographic data provide us with the following explanation: While English (and German) classify systems of religious belief in comparison with Christianity as prototype, Kikuyu uses several such systems which do not fit into European categories. The results from the comparison between established methods and Neumüller’s new method confirm the validity of the latter. Der Wert dieser Publikation liegt in dem Versuch, die seit Sapir und Whorf vielfach postulierte These von der Isomorphie zwischen Sprache und Denken bzw. Kultur anhand einer Fallstudie kritisch zu hinterfragen. Neumüllers Arbeit ist eine erfrischende, selbstbewußt geschriebene Arbeit, die zugleich als Einführung in die kognitive Linguistik gelesen werden kann.